The Hawaii: Next 50 Contest is inspired by former Governor George Ariyoshi’s book, Hawaii: The Past Fifty Years, The Next Fifty Years, which provided a retrospective look into our islands’ history as a state and prompts the next generation to think about what social, cultural, and economic roads we can take to keep Hawaii moving forward into the next century. Winners will be honored during a floor presentation at the Hawaii State Capitol, attend a luncheon with legislators, receive a monetary prize, and have their project published online. The contest is a collaboration of the Hawaii State House of Representatives, Hawaii Future Caucus, and aio Foundation. More information can be found on the contest website at www.HawaiiNext50.com and questions can be directed to HawaiiNext50@gmail.com. WHO: Students enrolled in grades 4 – 12 are eligible to enter. Submissions will be accepted in two categories: essay and visual arts (poster or video). Free copies of Hawaii: The Past Fifty Years, The Next Fifty Years are available by request at www.HawaiiNext50.com. WHEN: All entries must be submitted by 11:59 p.m. on January 31, 2016. Winners to be announced in March 2016. WHY: To challenge the up-and-coming generation to become stakeholders in shaping our future. 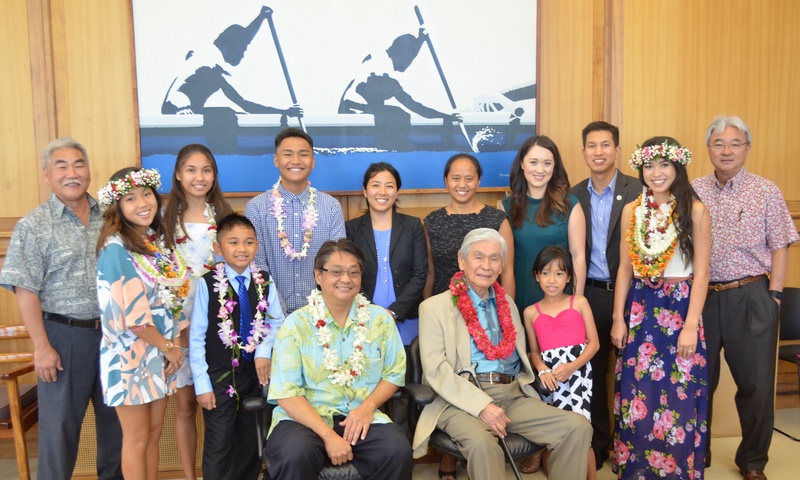 Winners will be honored during a floor presentation at the Hawaii State Capitol, attend a luncheon with legislators, receive a monetary prize, and have their project published online. 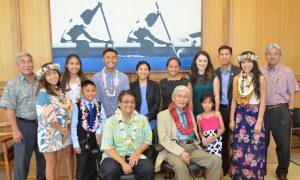 Photo Caption: Legislators at a luncheon on March 20, 2015 to honor the first annual Hawaii: Next 50 Contest winners, (by grade level) Dallas Kuba, Gr. 4-5 Essay; Teyshaun Rosales, Gr. 4-5 Visual Arts; Lindsey Millerd, Gr. 6-8 Essay; Bryson Manuel, Gr. 6-8 Visual Arts; Kiani Nishimoto, Gr. 9-12 Essay; Kaydee Rapozo, Gr. 9-12 Visual Arts.